Are you including a little bit of organic chemistry in your biology class. Many students grumble about this saying “We signed up for biology, not chemistry!” Of course, this represents a misunderstanding about what biology really is and that on a molecular level, all life is chemical. 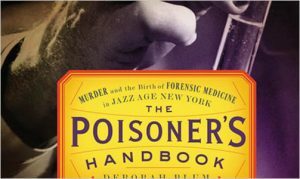 I like to spice up this lesson by including stories and excerpts from the book “The Poisoner’s Handbook” by Deborah Blum. What better way to get kids interested than to show them how a simple chemical like methanol can be intoxicating, and also deadly. Cyanide poisoning also provides a nice opener to discussing why oxygen is so important to the chemical reactions that occur in the mitochondria. 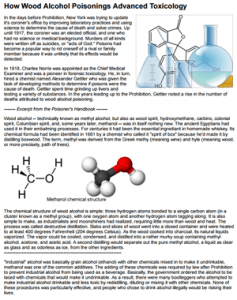 This worksheet explains the difference between ethanol and methanol and contains an except from “The Poisoner’s Handbook” and includes questions about the reading aligned to common core literacy standards.